At UCMAS, developing a lifelong love of learning in our students is our passion, and hence we don’t just tutor, we aim to inspire our students. 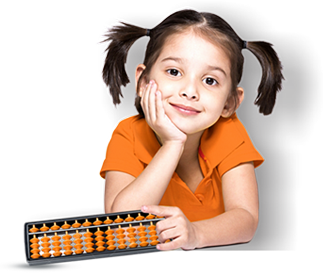 UCMAS program offers several mental math benefits that help children to develop their brain using abacus as a tool & basic arithmetic operations as a base. The human brain is structurally divided into various lobes and each of these lobes are connected to different fingers of our hands. In the UCMAS program children are trained on using both hands with different fingers on the abacus, which stimulates the lobes of the brain by increasing neuron interconnectivity and hence establishing a balance between them. The finger movement on physical abacus stimulates the nerves connected to the neural system, which in turn activates these various lobes. These are the frontal lobe, the parietal lobe, the occipital lobe and the temporal lobe. The usage of abacus with the two-hand technique enhances the working of the brain more efficiently resulting in structural development with physical abacus. The human brain is functionally divided into 2 sides/hemispheres the logical side and visual side. The left/logical side of the brain governs different functions related to number, text, sequencing, formula, and analytical interpretation, whereas the right/visual side of brain governs functions like face recognition, spatial memory, power of estimation and comparison, processing of tunes/ music etc. In the UCMAS program children are trained on arithmetic operations and formulas which are stored in their logical side of the brain, and while doing mental math, they convert the logical numerical representation of numbers into bead images utilizing their visual side of the brain and retrieving formulas which are stored in their logical brain, thus developing both the logical and creative functions of the brain simultaneously. The brain carefully balances and assigns control of certain functions to each side. It’s all nature’s way of ensuring that the brain ultimately splits up tasks to maximize efficiency. Tactile/ Kinaesthetic Learning Style: Tactile/ Kinaesthetic learners learn best when they can use their sense of touch using physical objects or body movement – The UCMAS program focuses on the physical use of abacus for representing and calculating numbers. Other activities like the types of speedwriting facilitate this type of learning. Auditory Learning Style: Auditory learners are those who learn best through hearing. In the UCMAS program students calculate by listening to numbers in extremely high speeds. In addition listening and writing jumbled dictations also help auditory learners. Thus strengthening their auditory style of learning. Visual Learning Style: Visual learners are those who learn and understand better through visual aid or by seeing and observing things. On going use of the physical abacus helps students visualize the beads of the abacus, hence giving them a gift of Mental Math. At UCMAS we conduct various activities with flash cards, which are bead representation of numbers. These activities help children enhance their visual leaning style.